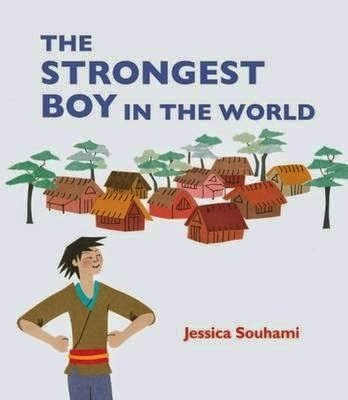 The Strongest Boy in the World is based on a popular and well-known Japanese tale from the 13th Century. A young boy, Kaito, dreams of becoming a champion Sumo wrestler, therefore rich and famous. He sets out for Kyoto and the wrestling tournament, convinced he can win regardless of his puny build. A meeting on the way with the strong and manly Hana changes his life. She carries carry water on her head without spilling a drop. In the short time remaining till the tournament, Hana teaches Kaito strength training, which foods to eat for muscle building, and how to hold his stances. On arrival, he is ridiculed by the huge wrestlers that refuse to take him seriously. But will confidence and absolute belief in himself bring Kaito to victory? And will the skills and disciplines Hana has handed on help Kaito in his quest for fame? This tale carries several themes, the most important being nothing is impossible, and believing in yourself can achieve miracles. The fantastic illustrations are boldly presented with collage of Ingres papers hand-painted with watercolour, ink and graphite pencil. This mixed media perfectly portrays the Japanese setting, and gives an added dimension to the full page pictures.